England have won the Ashes, you're having a great summertime and we're still travelling - it was touch and go a few weeks ago, but we're chuffed to bits to still be away! We've had a brilliant time exploring Laos, we started our trip on an epic journey from Hanoi, Vietnam, via sleeping bus (the beds designed for locals though so not ideal for us 6 footers!). We'd been told it could take from 22 - 38 hours but we managed it in 23 hours, with only one tyre change, then over the border to the capital. Vientiane is a friendly and small city along the Mekong river. It was our first taste of the famous Beer Laos too! The funny thing about travelling around Laos is you tend to bump into the same people along the travellers trail, which was great as we hooked up with some friends from Ireland, Avril and Sean, to Vang Vieng in central Laos. We all took part in the official sport of Laos - TUBING!! In summary: along with hundreds of others we took truck inner-tubes, down the dirty Nam Xong river, where you'd be thrown a line and hauled in to various bars (some with mud volleyball!) along the 3k route. 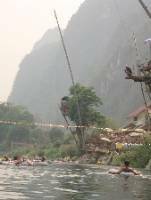 There was some jaw-dropping scenery, much Beer Laos, rope swings, diving boards, and one big hangover at the end! - probably one of the most unusual benders we've ever been on! Luang Prabang, our final destination - a Unesco world heritage city, it was absolutely beautiful. 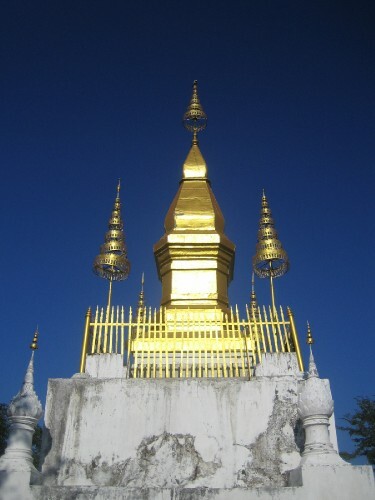 Hundreds of stunning Wats sparkling in the sunshine and orange-robed monks on every corner. Shuttered French mansions lined the lanes, where there were so many funky bars and bistros and some of the best accommodation we've had so far and some great cheap trekking through the forests and villages. It was such a photogenic place and by far the highlight of our time in Laos - we stayed 2 weeks we loved it so much! - yummy food too! Much of Socialist Laos is gripped in poverty and it felt very much like you'd imagine Thailand to be 30 years ago. 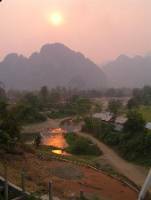 We highly recommend a holiday to Vietnam and Laos, it's been a great experience, you get a lot for your quid! Next we're off to Indonesia baby!